It's Pub Night: What Happened to Greg? A couple weeks ago, I was raving about Hair of the Dog's one-off Greg, available only at Higgins. I described it as tasting like a strong Belgian Golden, but amber in color, and had a photo of it to boot. It was quite a surprise to order one yesterday and have it be so totally different. 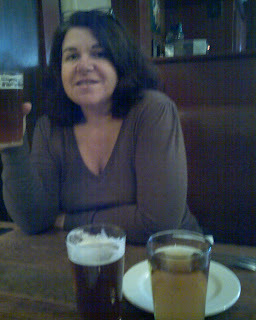 It's the beer on the right -- luckily our friend Lisa went with the cask Wreck the Halls like the beer on the left. Now, I didn't do a great job taking this photograph, but hopefully you can see that the color is much lighter than in the earlier photo, and there is apparently no carbonation. Those things are not necessarily bad in my book, but there was none of the Belgian-y flavor I was expecting -- not much flavor at all, in fact. A couple weeks ago, they did make a point of saying that the Greg that was on had been in the keg for several months -- they had switched to Hair of the Dog Blue Dot for awhile, so the Gregs just sat around. The Greg that's on now is from a fresh batch, but the variation seems greater to me than just the age. I do recall that the first time I had it (early 2006? ), I didn't care for it, then a few months later I tried it again and was surprised at how good it was. Looks like some batches are better than others. Still worth a try, if you want a beer that can't be had anywhere else. But you might ask for a sample first, to see which Greg you're getting.